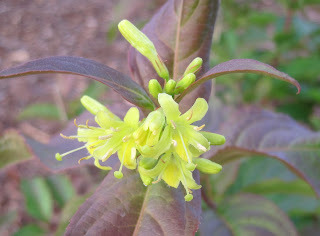 New in my garden, Diervilla lonicera. A native shrub, one of its common names is Northern Bush Honeysuckle. It's on Indiana's threatened and endangered list, where it is noted as "rare". The garden designer suggested it, and I looked it up and then said yes. I said yes to most of the plants she suggested, as I recall, and was enthusiastic about all her plant choices. She might recall that I was a gardener with definite likes and dislikes, who had to be convinced on the merits of some of the plants she suggested. Either way, look at that pretty yellow flower of the Diervilla, now blooming in my garden, a hint of what's to come on Garden Bloggers' Bloom Day next week on the 15th. I'd never heard of this one, but clicking through, it seems to be native here in Connecticut. Great suggestion - on the list! I have never seen this shrub before. I will have to try to find it. I wonder where your designer found it? A check on the internet says it's native throughout Canada as well, yah! Now if I can find it, I'll plant it. Three cheers for the garden designer! Good choice, Carol. We designers wished we had more clients like you. We have a variegated form of Diervilla lonicera at the garden center where I work. Most people have never heard of it. I've never heard about it either. But it certainly is beautiful. And I'm glad to hear that you're helping to preserve this flower. Love the copse and thanks for teaching me some new words.